I recently returned home from a mesmerizing five days in NYC and let me tell you I came back a little fatter and a whole lot happier. First on my list of decadent dining was Doughnut Plant. 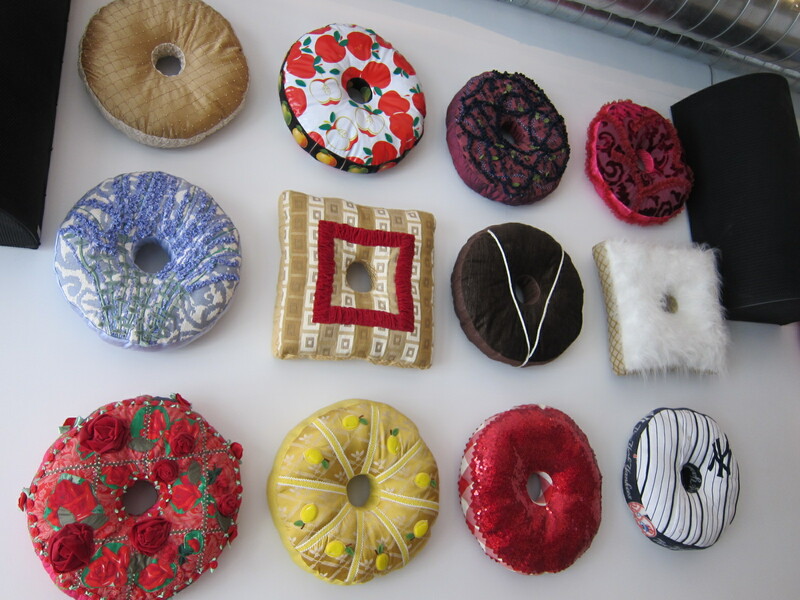 [In case you haven’t be keeping up here and here, I am completely obsessed with doughnuts. I think they may just be the best things on earth.] This was a much-anticipated pilgrimage to my personal Mecca, the holy land of fried dough. R and I decided to walk across the Williamsburg Bridge into the city to really earn our doughnuts. Upon arrival in front of the lower eastside shop, I was giddy with excitement. 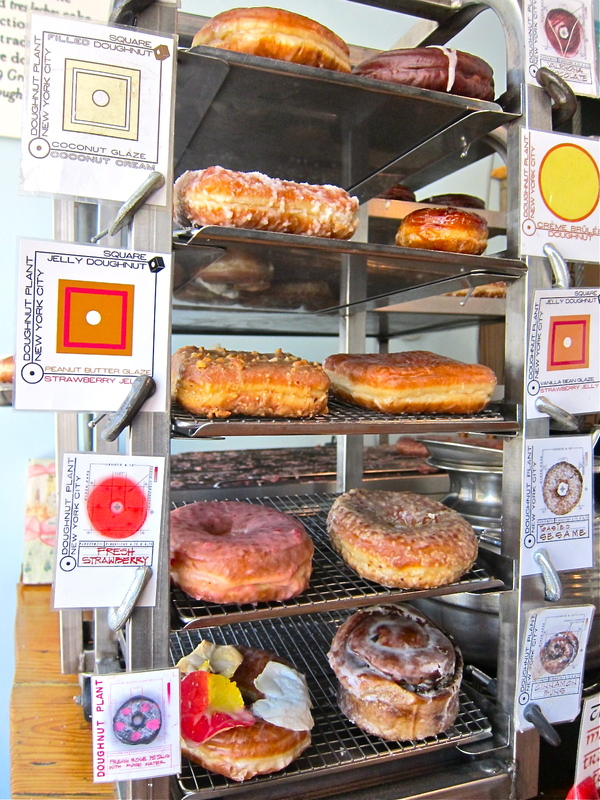 Doughnut Plant offers a daily selection of yeast (raised) doughnuts and cake doughnuts. 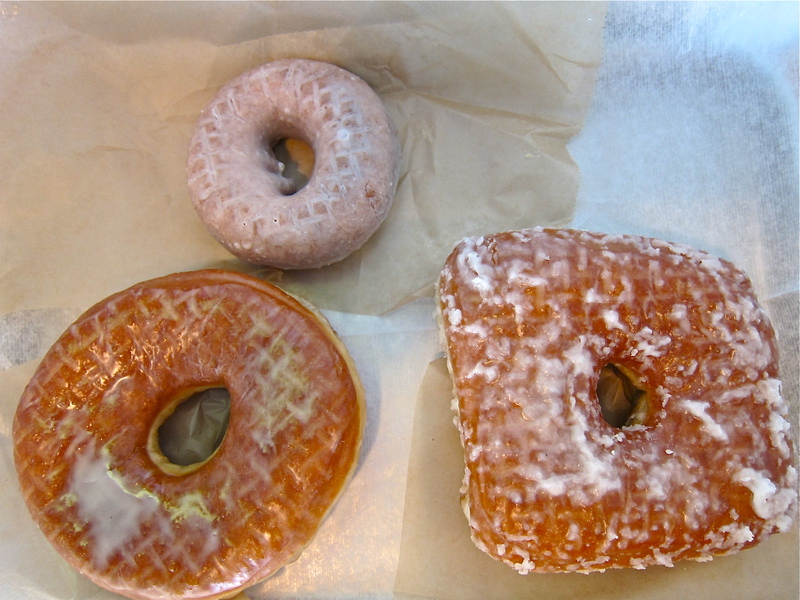 The yeast doughnuts are larger, fluffier and fried, while the cake donuts are smaller and denser. 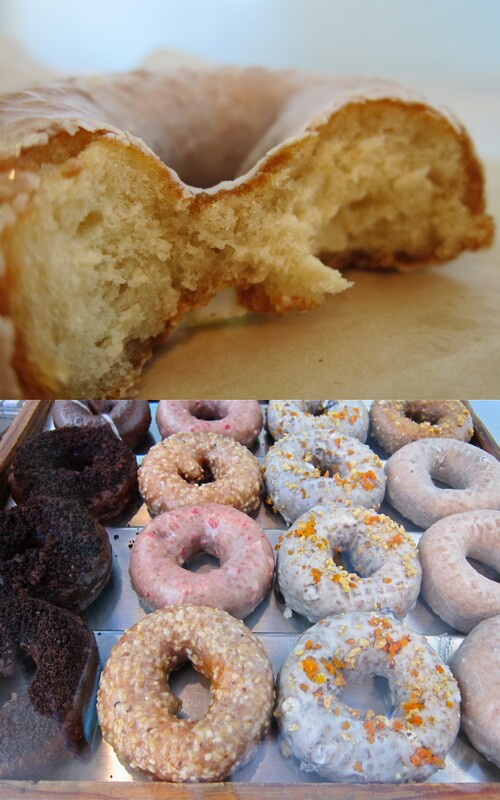 Doughnut Plant has tried and true mainstays as well as seasonal specials, all of which rotate monthly. Knowing we had a full day of eating ahead of us, it was extremely difficult to narrow down the selection to only three doughnuts. After what was honestly a good ten minutes of drooling over all the doughnuts available we made our decision: Vanilla Bean, Tres Leches and Coconut Filled. I choose vanilla bean because for some crazy reason I was thinking I should try what would be the closest incarnation to a classic glazed doughnut. Bad idea. While it was tasty enough, it paled in comparison to the other options available. The flavor was flat and uninspired. Let me preface this by pointing out that I NEVER order cake doughnuts. I find them dry and too dense. I much prefer the fried, fluffy, raised variety. With that said, the tres leches cake doughnut was full of flavors and textures that deceived and surprised me. It was moist and succulent with a delicate cream that had somehow perfectly woven its way throughout the dough. It was kind of magical. If you are a coconut lover like I am this is the doughnut for you. The exterior is perfectly light and doughy with a slight chew to it. It is coated in a barely sweet glaze and studded with shreds of coconut. Wedged between the luscious dough is a supremely rich coconut cream. One bite and you will be raising your hands to the sky and sighing in blissful delight. 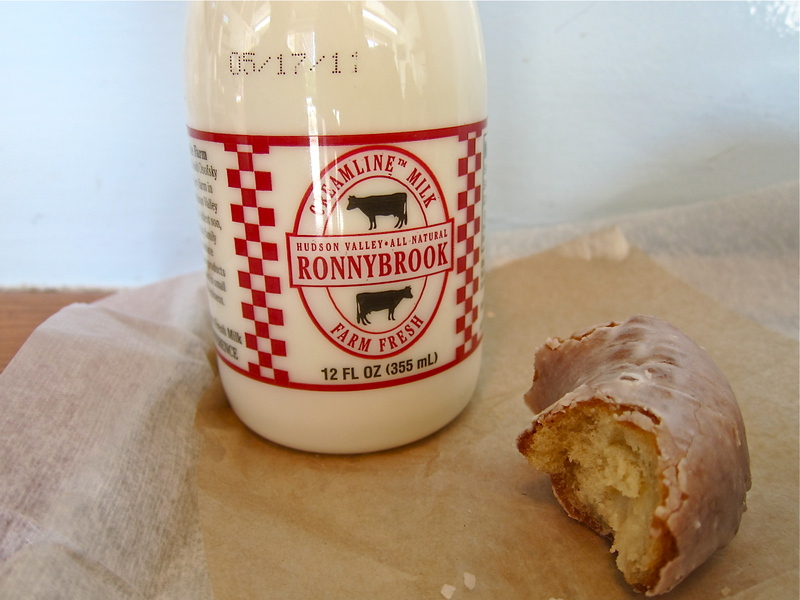 *Side note: Doughnut Plant sells the best milk ever: Unhomogenized milk straight from Ronny Brook farm in the Hudson Valley. It is rich, smooth and I swear it tastes like ice cream. It goes perfectly with a tray full of doughnuts. Our inaugural visit to Doughnut Plant left such an impression on our taste buds that we decided to add a second doughnut breakfast to our itinerary. This time we visited their newer location near the Chelsea Hotel. The space was bigger and brighter with more seating that allowed us to leisurely consume our sweet treasure. The day’s special was fresh mango – I hit the jackpot! This fried delight was coated in a sweet mango glaze with thin, almost unnoticeable slivers of fresh mango. The mango flavor was bright and prominent. It gave a bold fruity burst to the mellow dough below. Given our success with the cake doughnut we opted for two more. The oatmeal cake donut had a nice subtle cinnamon sweetness. The dough was fluffy and moist with specks of cranberries throughout. 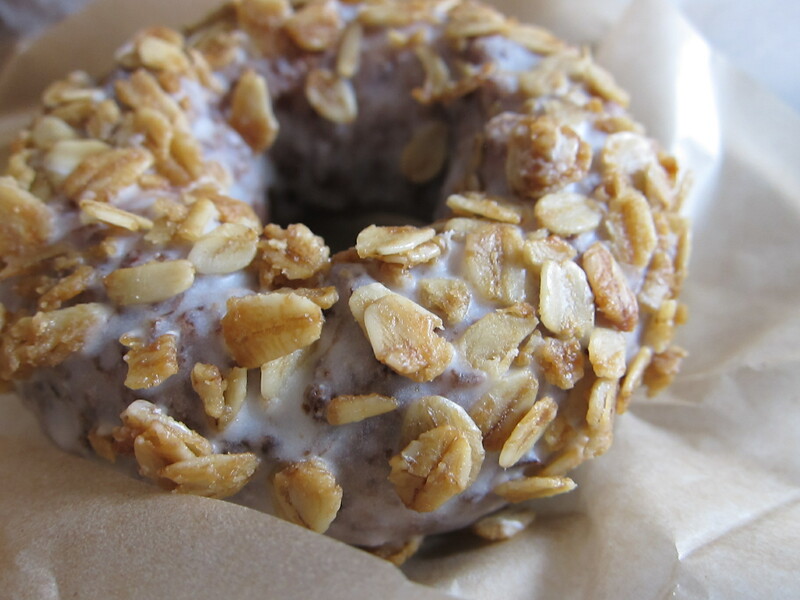 The toasted oats that crowned the glaze gave the doughnut a nice heartiness. 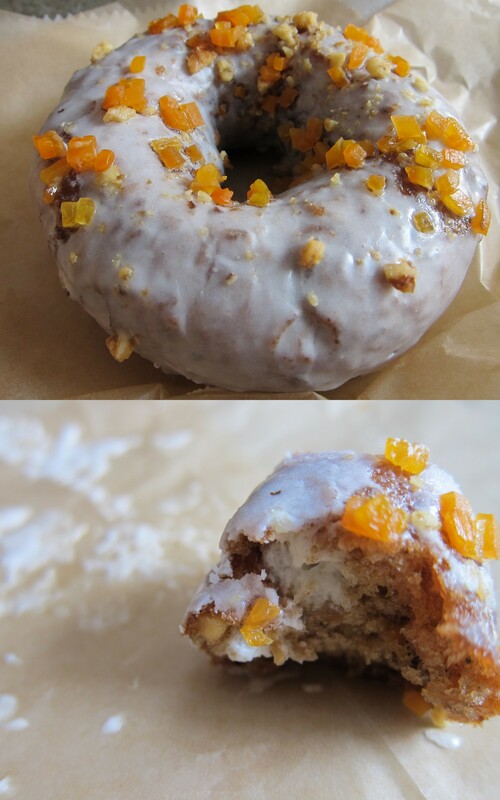 The carrot cake doughnut was nutty, buttery and sweet. It was topped with candied carrots and walnut pieces, which provided a nice contrast to the soft light cake. Decadent cream cheese was swirled in between folds of dough. The flavors were exuberant. After trying this I only want my carrot cake served as a doughnut. 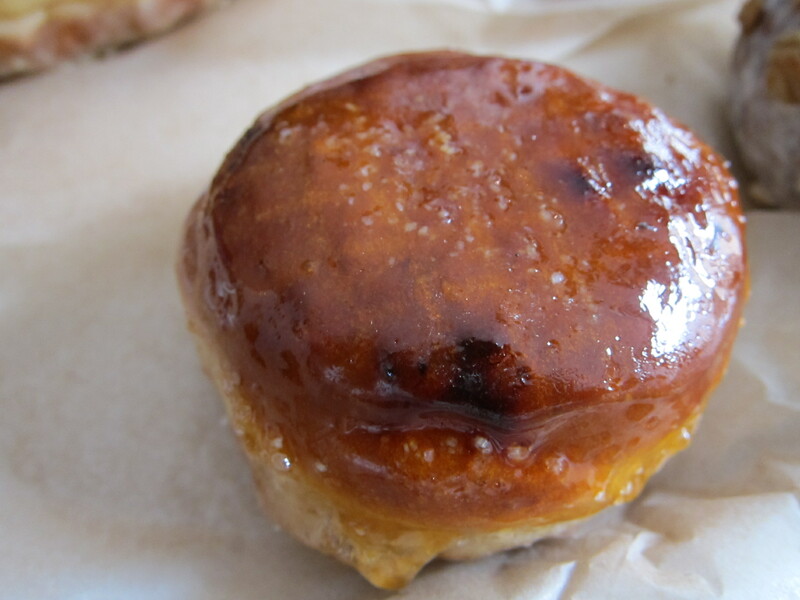 The crème brulee donut is dessert for breakfast. It has an enjoyable burnt sugar top that you crack into to reveal a soft and sweet doughnut filled with a heaping mound of luscious custard. Writing this post made me both hungry and sad. I now desperately yearn for a sweet glazed bit of paradise and I am a bit disappointed that LA doesn’t have an equivalent to NYC’s Doughnut Plant. Come back to us Frittelli’s! You were the closest thing we had to Doughnut Plant, a valiant second place contender that I miss dearly. 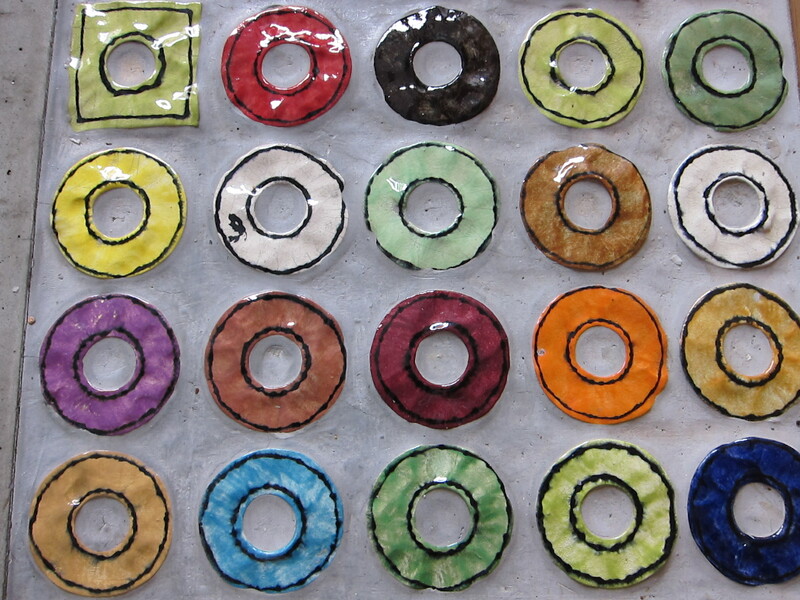 My fingers are crossed in desperate hope that the city of LA will soon have a Doughnut Plant of it’s own. Why: These may well just be the best doughnuts you have ever had! Previous PostPrevious This Day Calls For Cake! Next PostNext Momofuku Milk Bar: All Hail Butter and Sugar! Cool. I’m also a fan of Doughnut Plant. That carrot cake ‘nut looks especially good. Glad to see you mention Frittelli’s. That was my all-time L.A. favorite. Unfortunately, they were either ahead of their time, or in the wrong location. We’ll probably find a suitable replacement with fonuts. That should be good, even if Waylynn Lucas’ donuts won’t be fried. 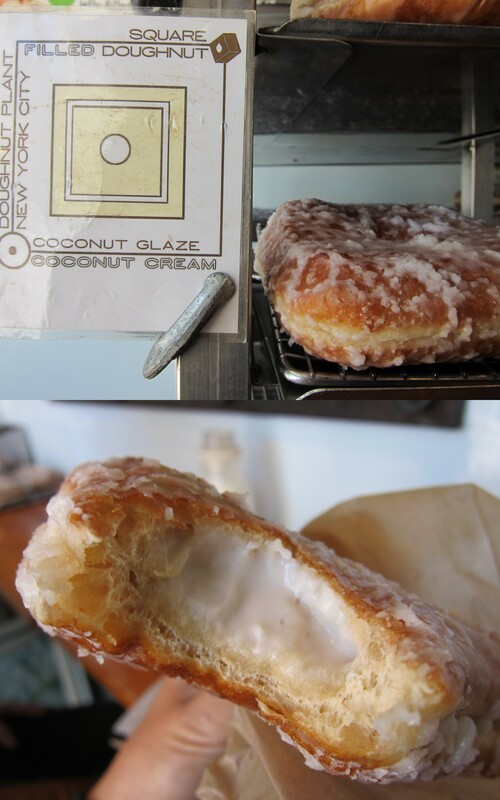 I am so totally getting a coconut cream doughnut when I’m in NYC next week! And as for Fonuts, WTF?! Not fried? I am very skeptical. I hope Chef Lucas proves me wrong. Lucky you! When I go back I’ll definitely have to check it out! 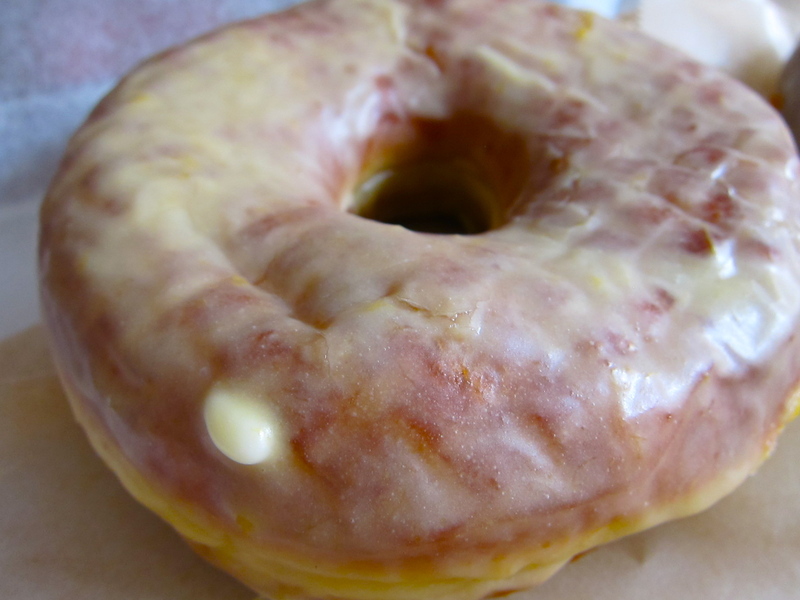 If you liked Doughnut Plant, you should try Dough in Brooklyn the next time you’re out here. I had them for the first time this past weekend – they also have great flavors but the dough’s even fluffier/lighter than Doughnut Plant! Hemang- You would have loved the mango! I’ve been a total fan of the Doughnut Plant since they opened. I agree that they are one of the “best things on earth!” On our recent trip, we made three stops there and I took home over $50 worth to share with family and friends. The crème brulee and the carrot cake doughnuts were amazing. As was the coconut cream, pistachio, tres leches, valrhona, organic orange, jelly doughnut…………. oh how I wish I would have gone there when I was in NYC in March ;( The doughnuts looks amazing: love all different shapes 🙂 And the art on the walll! I’m with you: not a cake doughnut fan. Wow, this might just put Voodoo to shame. Next trip to NY gets a donut mission for sure! Olga – Doughnut Plant has made me a cake doughnut convert! Leandra- More to come so keep checking in 🙂 I’ll send you a separate email too! Veronica- I’m still dying to try Voodoo donuts! i’m sure they are just as amazing! Wow! All these doughnuts sound amazing. Now you got me wishin that I had one right now! Donut Plant has the best donut in the United States! Next time I need to try a bottle of that milk. I went a few days ago and had the creme brulee doughnut, and OMG was it amazing. I loved how small it was compared to the others–made total sense since it was definitely sweeter. Can’t wait to go back and try the others.